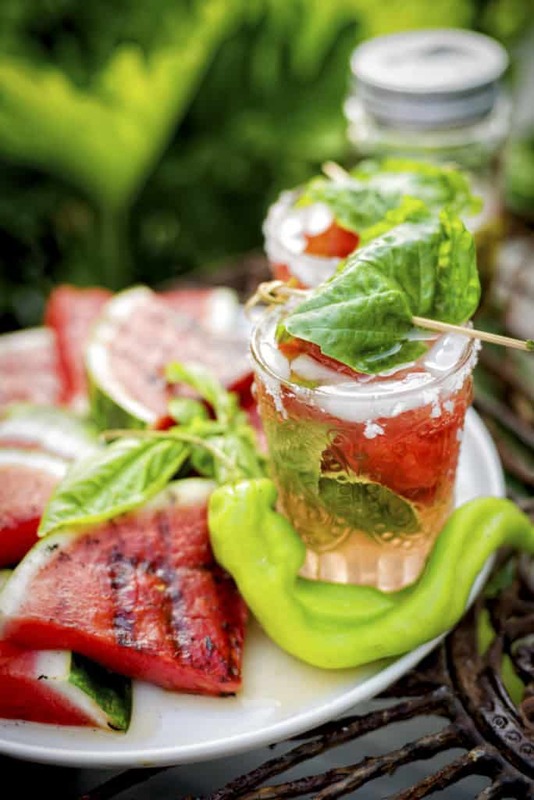 Sip on this Grilled Watermelon Margarita with Smoked Serrano Infused Tequila, a sweet smokey cocktail balancing adult flavors perfect for summer nights. One of the most refreshing parts of ‘adulting’ is allowing the transformation of your taste buds. They grow and evolve as we introduce more variety and stronger notes into our expansive collection of flavors. 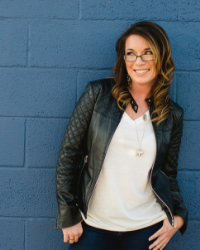 We become less fond of a small selection of tastes as we build complexity into our palette. One of our strongest reactions comes from spice – or heat. The heat of peppers is something most younger palettes’ avoid. We keep strong spices away for years before we work them in over subtly over time. Once we’ve honed our appreciation for the rush of the heat on our tongue, finding ways to balance that spice with other varieties of our taste senses becomes a fun challenge. Infusing Serrano peppers into tequila with pink and black peppercorns was building the smoky layers and spice to the smooth liquor. I knew that in order to drink it, besides sipping it slowly over ice, I would need to balance out the strong heat with a bit of sweet while not masking the creativity behind the infusion and just how it was meant to pull on the taste-buds. The idea was to take something otherwise feminine, watermelon margaritas, which could be a sweet summertime sipping cocktail, and turn it into a masculine cocktail with mature flavors. Accomplished by grilling the serrano peppers and infusing the tequila. And the final product, Grilled Watermelon Margarita with Smoked Serrano Infused Tequila, I feel, did just that. If you’ve tried my Grilled Watermelon Margarita recipe or any other recipe on passthesushi.com please don’t forget to rate the recipe and let me know where you found it in the comments below, I love hearing from you! You can also follow along for more good eats and travel tips on Instagram @passthesushi & @girlcarnivore, Twitter & Facebook. Char the serrano peppers over medium high heat. Remove from heat and allow to cool. Slice the serrano peppers into long thin strips. Place in an airtight resealable container and add the peppercorns and salt. Cover with tequila and allow to sit over night. Strain the infused tequila with a fine mesh sieve into a clean jar to store. 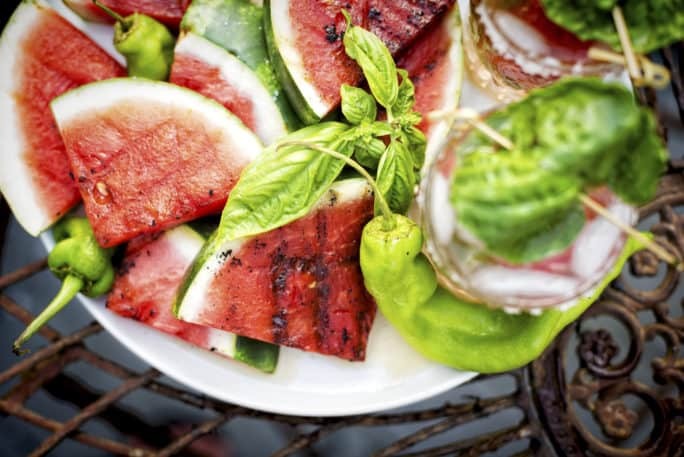 Sprinkle the salt over the watermelon on both sides and grill over medium high heat 3 to 5 minutes per side, until smokey char marks form. Remove from heat and arrange onto a platter. Season with additional salt if desired. When cooled a bit, cube up several slices of the watermelon. If salting the rim of your glasses, do so now. Add ice and several grilled watermelon cubes. 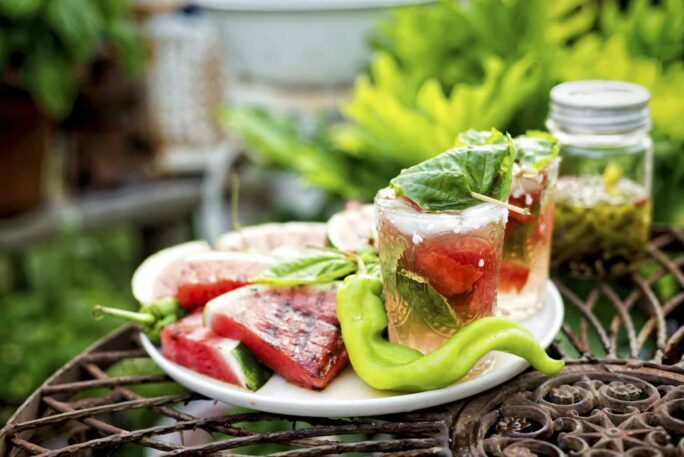 Pour in 3 oz Serrano infused tequila, 1 oz Anejo tequila and top off with the watermelon lemonade. Garish with a piece of cubed watermelon wrapped in a basil leaf, securing with a pick. Serve. Dang, just dang. I’ve never thought of grilling watermelon before. Or combining it with smoked serrano infused tequila. I better make this recipe before summer is over! Great photography too!